Universal have been steadily re-releasing a string of albums over the last couple of years as Deluxe editions with lots of extra material thrown in. 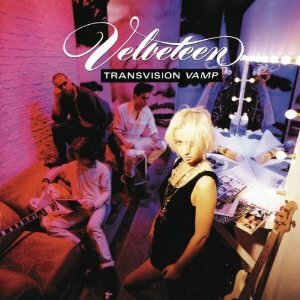 They've covered a wide range of artists across a range of genres, but now it's the turn of 80's pop band Transvision Vamp with their two hit albums, "Velveteen" and "Pop art" getting the deluxe edition treatment. Unlike many of the 80s pop acts, Transvision Vamp weren't a polished result of the Stock-Aitken-Waterman hit factory, but instead combined a punk sound with pop to make some great music which had a lot more of a kick than most of the other music in the charts. Velveteen was the band's second album, released in 1989 and reached number one in the UK album charts. It spawned four singles that got into the top 30, with "Baby I don't care" reaching number 3 in the charts. The Deluxe edition is a 2CD release, with the first disc containing the original album. It sounds great, and is just as listenable now as it was when it first came out. The second disc contains the bonus material. You've got some B sides from the singles, a couple of extended versions of songs from the album, a couple of demo versions of songs. The demos and B sides are a great addition - between them thats 11 songs that weren't on the album, so if you have the original album this is still definitely worth getting for the 11 "new" songs. Add in another four tracks that are different versions - either live or extended versions of tracks from the album and you've got a great collection of bonus material - over an hour of it. OK I might be slightly biased as I'm a big fan of the original album, but I think this is an excellent release. Fans of the album are going to love this new version with all the bonus material - there's just so much new stuff here that it's an essential purchase for Transvision Vamp fans.